Chinese company Dazzle is set to launch its Dazz 3D L120 Pro, an SLA/LCD-powered 3D printer hoping to fill the gap between cheaper no-frills devices and the $2,500 – $5,000 monsters that dominate the field. I put a review unit through the paces to see if it could deliver on its ambitious Kickstarter campaign promises. Typically, I don’t cover Kickstarter projects unless they’ve already started shipping, but Dazz 3D’s track record on the platform is impeccable, and the L120 Pro absolutely smashed its goal of $30K. With less than 24 hours left, it’s currently sitting just shy of $200K. That being said, seeing is believing. After getting my hands on the L120 Pro, which also comes in a basic model that drops the touchscreen, I can see what all the fuss is about. 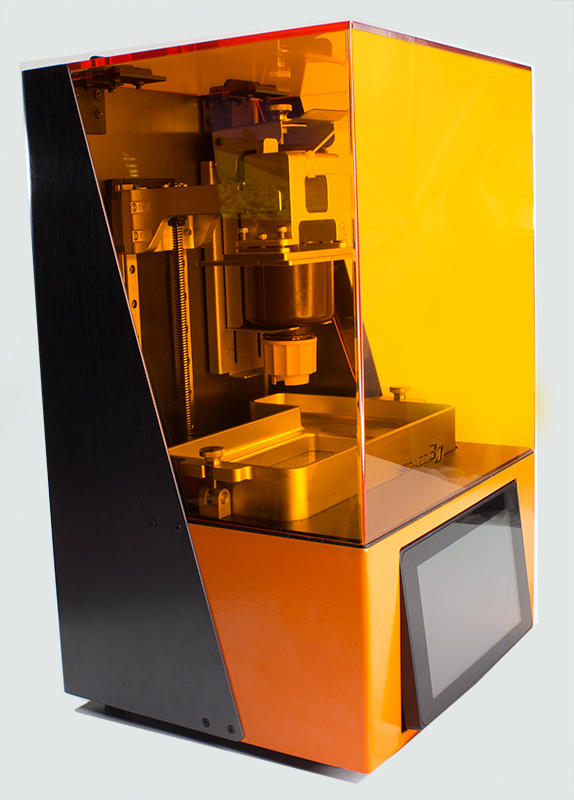 Unlike many other 3D printers, the L120 Pro uses purple LED light generated from an internal 2K LCD to manipulate resin. This allows it to print with higher accuracy and speed than many of its laser-powered peers. It also helps keep costs in a relatively affordable range. In the looks department, it is definitely a conversation-starter. If you’ve got this sitting in your office someone is bound to ask about it. 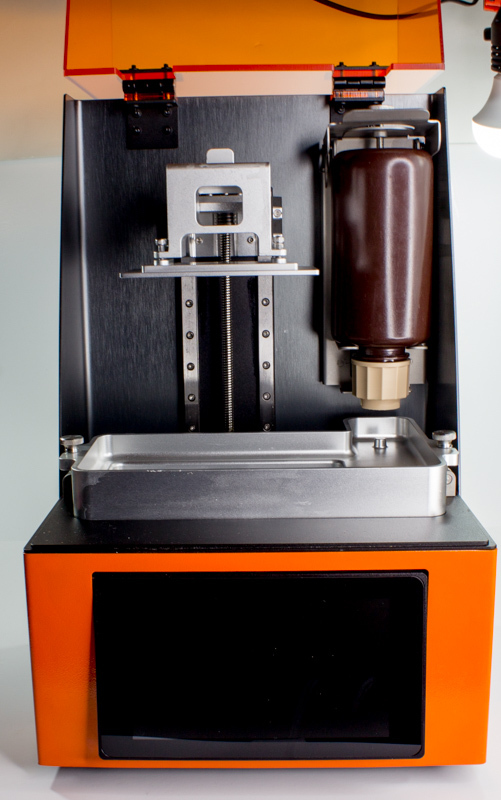 The orange-tinted plastic cover lets you watch as it prints, and gives it a nice warm vibe. It reminds me a bit of a popcorn machine, but the touchscreen makes it look like fancy tech. It might not do enough to separate itself from the field aesthetically, but it certainly does in operation. 3D printing aficionados likely realize that competition is pretty stiff in the market, there’s a lot of devices out there. Unfortunately, as the market’s a bit saturated, there’s plenty of quality concerns too. Moreover, many 3D printers aren’t very accessible, the software can be difficult to use and often there’s little recourse when things don’t go as planned. If you’re new to 3D printing, the learning curve can be daunting. Not to mention the potential frustration of spending hundreds (or thousands) of dollars on something that consumes resin (not cheap) and takes hours to produce results. If things go wrong you’ve wasted your own time and money. Luckily the Dazz L120 Pro is a dream-come-true for noobs. Even if you’re just now hearing about the existence of 3D printers, you can make this one work. There’s no prerequisite knowledge required to get started. Of course, if you want to design your own custom printing files or access advanced features – basically anything beyond importing a file and printing it – you’ll need to educate yourself on the ins and outs of 3D-modelling. But, you can legitimately go from unboxing this thing to starting the print process in less than 30 minutes. I ran into some connectivity issues that required some reboots and reconnects, but otherwise I was awe-stricken by how easy it is to make this thing print stuff. The bundled “DDStarter” software is bare-bones but simple to use. I’m not a designer by any means, so all I’ve done is load .STL files, select my printer, and watch as it turns khaki-colored goo into real objects. I like that it automatically generates supports for the models I print and, based on my limited muddling, it seems pretty fool-proof. It is, as stated, very simple and I’m sure that power users will use it as little more than a place to import their files to. In use, it’s actually very quiet. You can hear it working but you won’t have to raise your voice to talk over it. This isn’t a 3D printer you need to keep in the basement or workshop. It doesn’t take up a bunch of space and it won’t make a mess (unless you handle the resin poorly). Basically, it’s no noisier than a microwave oven and takes up about the same amount of space. The quality of products it produces is fantastic, and that’s what really matters. Objects made with it are exquisitely detailed and matched the .STL files they were printed from with incredible accuracy. The internal 2K LCD makes all the difference here. Similarly priced SLA printers using 1080p screens simply can’t compete when it comes to fine details. The bottom line here is that you can get a 3D printer cheaper than this one, but the chances are pretty good you’ll end up wanting the L120 Pro or something more expensive sooner rather than later. Of course, the L120 comes in a touchscreen-free basic version which is cheaper by $300. I didn’t get the opportunity to test that one, but assuming it operates as well as this one, it might be the better option. I will say that I really liked the touchscreen though, at-a-glance information on print status is nice. I do have a couple of gripes, though they’re pretty minor. I wasn’t a fan of the documentation the company sent me. I felt myself frustrated at the lack of a quality video tutorial, and the PDF file I read was written like an IKEA assembly manual. It had the info I needed, but nothing more. And I also thought it was way too easy to screw something up with access to the Raspberry Pi operating system through the touchscreen. I didn’t have any problems, but accidental clicks found me in the root folder more than once. Both of these are pretty small potatoes though, and it bears mention that this is a pre-release product that will almost certainly have better support documentation and, hopefully, software updates post-launch. At the end of the day I’d recommend this printer over any other sub-$1,000 priced competitor I’ve tried. If you don’t need an expensive industrial printer, but you want something more than starter gear, you’d be hard-pressed to find a better combination of quality, ease-of-use, and cost than this one. 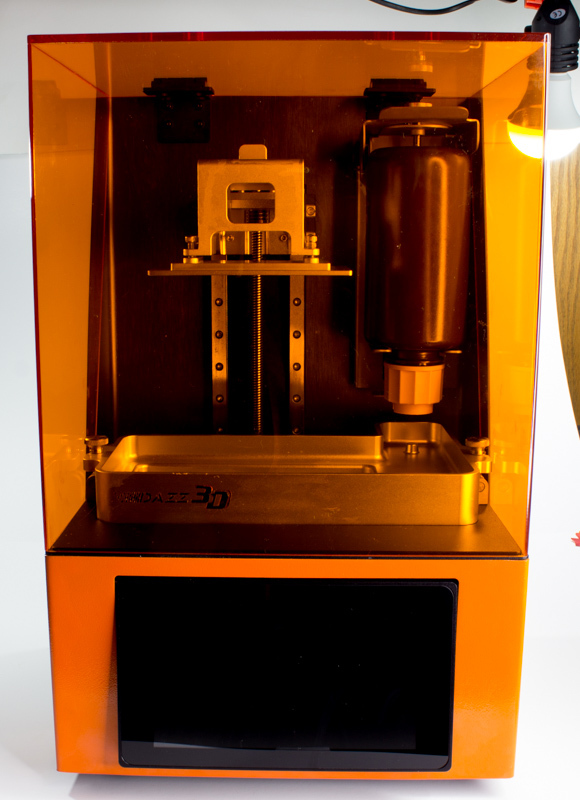 The Dazz 3D L120 Pro is available via Kickstarter and is scheduled to begin shipping in December.